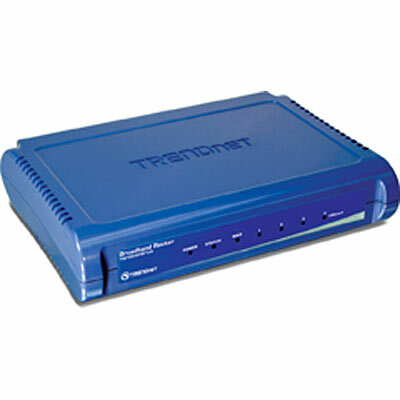 TRENDnet has a wide-range of broadband routers to its credit. The company has given great attention in designing and developing its products. The TRENDnet TW100-S4W1CA Cable/DSL 4-Port Broadband Router is a product with revolutionary features and enhanced security options. Get high-speed connections and secure networking with this advanced broadband router. It allows the customers on the network to share high-speed Cable/xDSL Internet connection without any worries. Four 10/100Mbps half/full duplex switch ports allows improved Ethernet networking speeds and they connect to the workstations directly. This means, you can stream high quality videos effectively and without any interruptions. This router acts as a firewall for your PC and protects the system from hackers and certain traffics. It permits up to 253 users to access and browse the Internet at the same time using a single ISP account. This makes the router suitable to be used in large organizations and firms. Instant recognition to other devices is possible with the Universal Plug and Play. This router facilitates secure remote management. The device offers support for Cable/DSL Modem with Dynamic IP, Fixed IP, PPPoE and PPTP Connection. It offers support for IEEE 802.3 10Base-T Ethernet and IEEE 802.3u 100Base-TX Fast Ethernet standards. The supported network protocols are TCP/IP, NAT, PPPoE, UPnP, HTTP, DHCP Server/Client and SNTP. As for connectivity, it features 1 x 10/100Mbps Port (Internet) and 4 x 10/100Mbps Auto-MDIX Ports. Faster data transference up to 100Mbps/200Mbps is possible with this device. For ease of handling, the device supports controls and LED Indicators for Power, WAN, Link/Act and LAN ports. The device of 154 x 110 x 33mm size and 225g weight can be handled conveniently. The supported firewall features are NAT, IP / MAC Address Filter, Domain / URL Blocking, Scheduling and UPnP. It supports VPN features like IPSec and PPTP pass-through. The product is backed up with 3-year limited warranty. TRENDnet TW100-S4W1CA Cable/DSL Broadband Router comes complete with Multi-Language Quick Installation Guide, User’s Guide CD-ROM, RJ-45 Cable (1.5m/5 ft) and Power Adapter.